KUALA LUMPUR (May 12): The FBM KLCI ended below 1,800 points as Greece's debt sentiment and the global bond sell-off persisted. At the 5pm closing bell, the KLCI declined 6.88 points or 0.4% to 1,798.61 points after trading in red territory throughout the day. Stocks such as Petronas Dagangan Bhd, SapuraKencana Petroleum Bhd and Petronas Gas Bhd contributed to the KLCI's losses. Reuters reported that volatility in the bond markets weighed on stocks, adding to existing investor anxiety over the perilous state of Greece's finances. In a closely-watched Eurogroup meeting on Monday, euro zone finance ministers welcomed progress in negotiations between Greece and its creditors but said more work is needed to close a cash-for-reform deal. 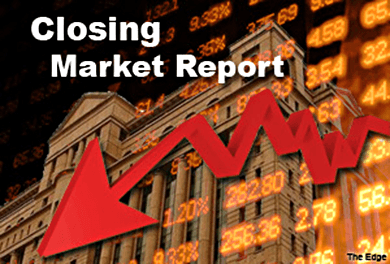 Across Asia, South Korea’s Kospi closed 0.03% lower while Hong Kong’s Hang Seng fell 1.12%. Japan’s Nikkei 225 was up 0.02%. In Malaysia, a bank-backed research house analyst told theedgemarkets.com the KLCI was under selling pressure after the index opened below 1,800 points today. “It led investors to sell,” he said over telephone. The analyst said he foresaw the index consolidating further. From a technical viewpoint, Kenanga Investment Bank wrote in a note earlier today the oversold situation in Malaysian shares appeared to be deepening as indicators headed further south. “This further supports our view that the key index could potentially find its footing around the 1,800/1,780-support zone where we expect buying support to emerge,” Kenanga said. Across Bursa Malaysia, 1.63 billion shares worth RM1.7 billion were traded. Market gainers trailed decliners by 240 versus 576 while 319 counters were unchanged. The top gainer was Nestle (M) Bhd, while the leading decliner was Pet Dagangan. The most-active counter was Kanger International Bhd warrant Kanger-WA. In currency markets, the ringgit weakened to 3.6163 against the US dollar and 2.7077 versus the Singapore dollar. Reuters reported that most emerging Asian currencies lost ground on Tuesday as persistent concerns over Greece's debt crisis checked risk appetite and as rising US Treasury yields dented the allure of higher yielding assets in the region. The Malaysian ringgit led regional losses as sliding oil prices heightened worries about the impact of lower crude on the country's current and fiscal accounts. Malaysia is a net oil exporter.